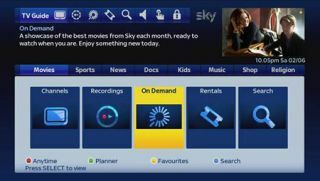 Sky introduces enhanced electronic programme guide | What Hi-Fi? Sky has today begun the rollout of its new EPG (electronic programme guide) for Sky+ HD set-top boxes. • New categorised recordings in the Sky+ planner, meaning customers can browse through their recorded programmes by genre for the first time, with content divided into categories such as entertainment, movies, sports, news, documentaries or music. • New landing page for different genres. Sky Movies viewers, for example, can choose from a series of simple icons to watch movies live or on-demand via Sky Anytime+, browse movies stored on their Sky+ planner, rent a movie from Sky Store or search for a particular film, all through a single page. You can watch a video demo of the new Sky EPG by clicking here.